It’s the time when the jostling for positions inside the top eight really turn up and gets to a point where dropping any game could prove to be the downfall between a home final, an away final or, in the case for the clubs at the lower end of the eight, missing out altogether. So in the ultimate race to the finish, who is a tease, who is a certainty, and who are the ones that can realistically challenge for the flag? 1. Where will the Cats finish? While there is still some doubt over positions 6, 7 and 8, Geelong are turning into one of the more intriguing stories of the year. We all know the storied success of this club in the current era with plenty of premierships and finals but at the conclusion of Round 16, it would seem than many are still yet to get a proper read on this side and where they might finish eight weeks from now. There have been the good Geelong performances, the likes of which we saw on Thursday night, and there have also been performances where they have been left wanting. Their inconsistency as a collective group has left them as one of the great teases and teams to watch for the rest of 2018. 2. Where to now for Adelaide? Richmond are scary and took no prisoners on Friday night, leaving in their wake an Adelaide team whose season is now hanging by the barest of threads. While mathematically it’s still possible, finals seem a long shot for this struggling team. With a difficult and important month coming up, the margins for error are getting smaller and smaller. When does this side start planning for next year or do they keep on trying to make a run for it? 3. Who sent the biggest message yesterday? So many different threads out of this one. There are a lot of questions about Carlton and how bad they are travelling at the moment. The Lions made a huge statement by playing their exciting brand of footy and one young player stood out like a beacon and sent a message to the Carlton match committee in the same process. Eric Hipwood and Harry McKay were both selected in the first round of the 2015 draft. McKay went at ten while Hipwood went four picks later at 14. On the weekend, Eric Hipwood lined up for his 45th AFL and kicked six goals in a big breakout game while Harry McKay was sitting in the grandstand at the Gabba watching it all unfold. Through injuries, form and lack of opportunities, McKay has only managed eight matches over his three-season career so far, but it is his output (averages two goals per game) that has left the Blues fans bemused at his constant non-selection. 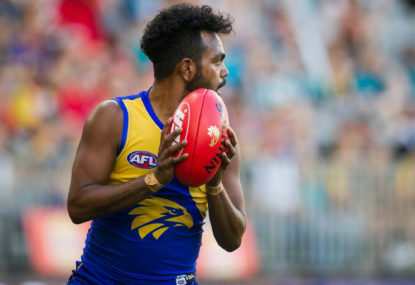 Hipwood has been played and played and played, largely unsighted in the early games but now it seems all of that senior experience early is starting to bear fruits with continuous, consistent performances. You would hope that Carlton bite the bullet soon and not let McKay wither in the VFL much longer so he has a chance to grow and realise his talent. 4. Who could be the one to rattle the Tiger cage? 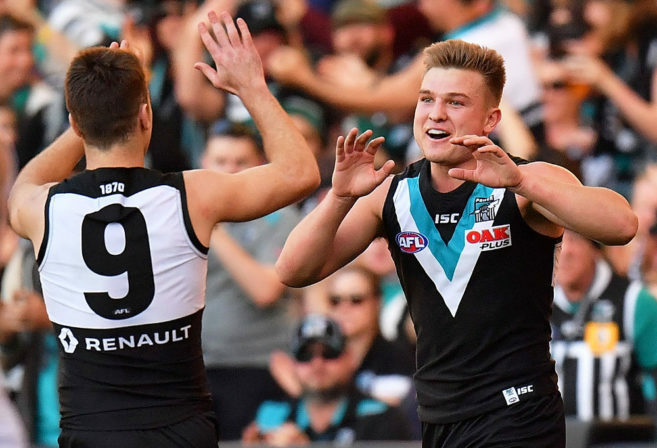 While they might have won ugly on the weekend, Port Adelaide are stamping themselves as a contender and are now emerging as one of the few teams that could take it up to the Tigers. The litmus test will be the MCG, where they face Collingwood in a few weeks. To be able to go with Richmond you need to be able to score, which Port Adelaide do, with their rich attacking stocks. Their midfield is starting to click nicely with Ollie Wines, Sam Powell-Pepper, Tom Rockliff, Chad Wingard and Robbie Gray all going along nicely. Their biggest question mark is on arguably their most important player being fit, that being Tom Jonas and his troublesome knee. 5. What would be worrying for Ross Lyon? One of Ross Lyon’s biggest criticisms has been around a failure to adapt to conditions and change and tinker the game plan accordingly. Although Melbourne dominated the first term without hurting the Dockers and continually wasted opportunities to further bury them on the scoreboard, Lyon was fired up at the first break as his players failed to adapt to the conditions. Max Gawn ended any Fremantle hope on the three-quarter time siren, the Demons finally going on to punish the tired Dockers in the final term. Melbourne finished with 50 more forward entries and 78 in total – five short of the all-time record they matched in Round 8 against Gold Coast. 6. Need we be reminded who the master is again? We said a few weeks ago that Hawthorn remained the sleeping giant in the race for the finals and September action. In an emotionally charged week down at Waverley in which they said goodbye to club and AFL great Cyril Rioli, the Hawks flexed their muscles in the second half on Saturday night to remind the competition of why they were so mighty for so long. With all their big guns firing on the night and with their favourable draw, the Hawks are priming themselves for their run home. 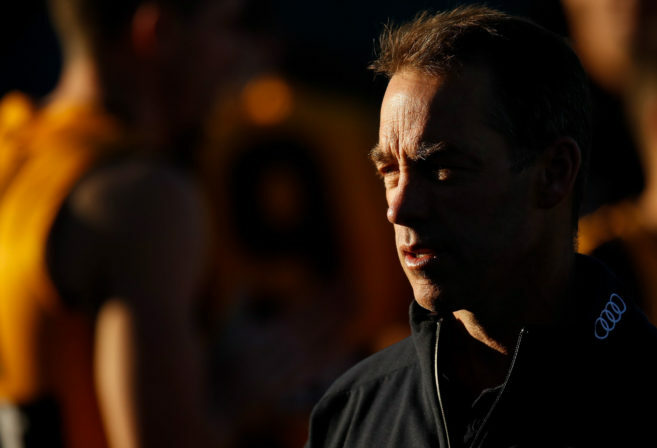 If there is one coach in the league that would be capable of constructing a game-plan to dethrone the Tigers, it would be Alastair Clarkson. They have eight weeks now to train and get it right. 7. Do we have a winner? North Melbourne kept on winning to keep their season alive, and Ben Brown put one hand on the Coleman Medal. Another four goals yesterday, and while it could have been so much more, he increased his tally to 46 and kick further away from the competition behind him. With seven games to play, he will be pushing towards the 70-goal mark. He will face some competition from the likes of Lance Franklin and Jesse Hogan and Jack Riewoldt, but it would seem that this award is pretty close to settled. Clear the calendar. Round 19, Saturday afternoon, MCG, Richmond versus Collingwood. The MCG is pretty big and can usually accommodate a lot of footy fans, but we might need a bigger stadium if these two sides keep on going the way that they are. A potential dress rehearsal for a day late in September? Maybe. It’s great for the competition that two of the powerhouse clubs are playing great footy and are up the top of the ladder. One of the other traditional powerhouses were pretty plucky yesterday against a very professional Collingwood team. As for the other one, well, there’s a lot of work to do there. 9. Who is the royal family of football? As the football community bid a sad farewell to Cyril, the next chapters of the Rioli name and legacy to football are only starting to be written. Cousin Daniel, already etched in Tiger folklore forever for his role in the Premiership triumph, lit up the ‘G again on Friday night. Over in the west, cousin Willie is making a name for himself at West Coast and, as only Riolis know how to do, making the biggest impression on the game when it counts most. Football has had many great royal families producing generations of special players to an array of clubs. But there arguably hasn’t been a family that has had such an impact on the entire Aussie rules landscape as the Riolis. We have all been blessed to see the likes of Cyril provide all his brilliance on the football field (unless it was against your team) and hopefully there are still many generations of great Riolis to come.